Call it an early promotion: kindergarteners at the notoriously-overcrowded Oakland Terrace Elementary School in Wheaton will soon be bused to empty classrooms at Sligo Middle School due to a lack of space. Both on and off the blog, I've heard from concerned parents who say Montgomery County Public Schools' latest proposal could put their kids at risk. 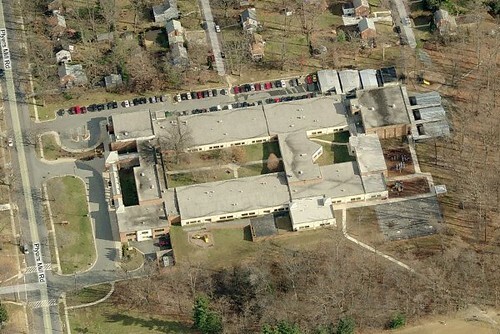 Oakland Terrace Elementary School. Photo from Google Street View. Oakland Terrace is located in a 1940's-era neighborhood where few new homes have been built but many have recently sold to families with young children. Nearby McKenney Hills Elementary, which closed decades ago and became an alternative school, is scheduled to reopen (warning! PDF file.) in three years. But it'll be too late for Oakland Terrace, which was renovated in 1993 to hold 456 students, has 792 kids this year, and by 2012 could have as many as 964 enrolled. In this presentation given to parents earlier this week, MCPS officials propose that next year's kindergarten class be sent to a "satellite school" at Sligo, located on Dennis Avenue one and a half miles away. That school has space for 963 students, but as many as 440 of those spaces will be empty for years to come, according to enrollment projections. Oakland Terrace already has six portable classrooms and room for no more. Given the circumstances, the idea of putting some Oakland Terrace students in empty classrooms at another school sounds like a practical short-term solution. But my first reaction to this story was, "Why aren't we putting older students there?" It would make sense to put fifth graders at Sligo Middle School. My brother is currently a fifth-grader at the 744-student Galway Elementary School. From what he tells me between extended video-game sessions, his schedule sounds like a middle-schooler's: different teachers for each subject and skill level and students who move from one classroom to another throughout the day. Fifth-grade students are obviously closest in age and maturity to their middle school counterparts. 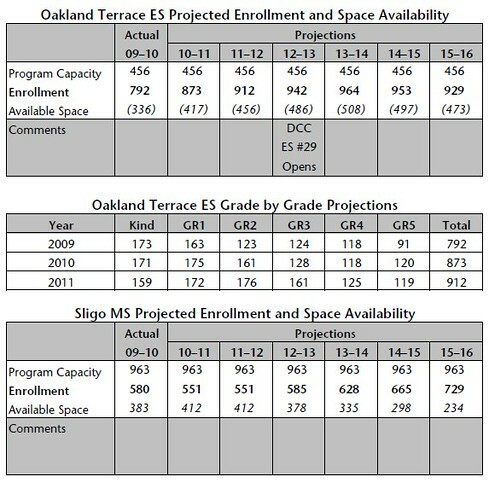 Current and projected enrollment at Oakland Terrace Elementary and Sligo Middle School. Putting fifth-grade students at Sligo could be a big help to the gifted-and-talented. Providing advanced instruction in elementary school either means busing kids to magnet schools far away (as I was at that age) or hiring additional teachers. With this arrangement, the advanced students could just take sixth- or seventh-grade classes at Sligo. Unfortunately, the bulk of Oakland Terrace's student growth is coming from the lower grades. This year's 173-member kindergarten class is nearly twice the size of the 91-member fifth grade, and the classes to follow are just as large. Putting just fifth graders in Sligo's ten empty classrooms wouldn't be a good use of space and it wouldn't help Oakland Terrace much either. So why not put the entire fourth and fifth grade classes there? With about 210 students between them - and an average class size of 25 students, according to this fact sheet - you'd fill the empty space at Sligo, clear even more students out of an overcrowded Oakland Terrace, and help acclimate older kids to a middle school they'll be attending anyway in a year or two. 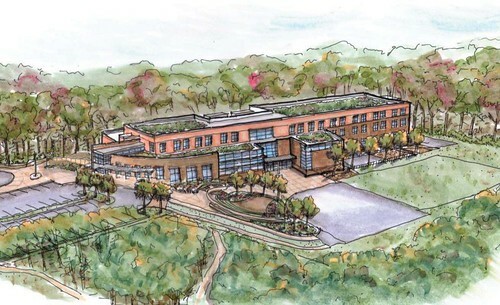 The new McKenney Hills Elementary School could open in 2012. Image courtesy of Grimm + Parker. A lot of questions remain about this proposal. For instance, how will elementary students at Sligo take art, music or gym classes? Where will they go to the library? Will they need to shuttle back and forth between the two schools? But I think it's a clever solution to a problem that'll hopefully be solved in a few years when McKenney Hills re-opens. Nonetheless, MCPS must reassure Oakland Terrace parents that their kids will get a safe learning environment, whether at their own school or at Sligo. Concerned parents can learn more about the Oakland Terrace-Sligo proposal at the next meeting of the Overcrowding Workgroup, set for this Monday, December 14 at Sligo Middle School, 1401 Dennis Avenue. (We'll let you know what time it is.) In the meantime, check out this packet on the proposal and this one about the new McKenney Hills Elementary, set to open in 2012. I just wish the homeschooling movement could shed it's "religious" stigma. If the county weren't so hostile to homeschooling, it would see the blindingly obvious solution here: invite parents of Kindergartners and 1st graders to "hybrid" school their children. Many of these parents haven't returned to work and would relish another year or two with their babies, even if for only half the day. The school wins with fewer kids in the lunchroom. The parents win with more time with their children. The children win with the best of both worlds. Interestingly enough, my (former) Sligo children are with a (former) Oakland Terrace student - whose little sister would be in kindgergarten there next year - and together they're doing (decidedly nonreligious) homeschool today. So this one hits close to home! It's equally insane to put kindergarteners or 4th/5th graders in the Sligo environment. What I do not understand is how it is taking close to 4 years to get McKenney Hills back to an elementary school. That decision happened in 2008, right? I look at the timeline and it takes 3 years just to award the contract. Mindboggling. The building is there, isn't it? No, McKenney Hills was torn down in November. Use some space at Stephen Knolls School, which is practically withing walking distance of Oakland Terrace. Try some really innovative "reverse mainstreaming." @Kate: McKenney Hills is still being torn down now. @FunkyGawy: Yeah and these kids were all born in area hospitals in the years before, so it's not like the population growth wasn't expected. Yeah, the county needs to rethink its hostility to homeschooling. Parents of K and 1st graders who would like to collaborate with teachers on the three R's and relieve the school of another child at lunchtime, should be allowed to do so. Hybrid Schooling is the blindingly obvious solution here. Calling hybrid schooling the "blindingly obvious solution" (twice, no less) is just silly and doesn't address the real issue. Homeschool if you like, more power to you. But many families are unable to or (gasp!!) just don't want to. And as for your assertion that many parents haven't returned to work yet, I would highly doubt that this is the case. MCPS needs to provide real and appropriate answers to families' needs, and that includes school facilities suitable for the ages of the kids it serves. 1. The cafeteria is located on the other side (west side) of the school building from the basement classrooms, and for kindergarten kids, and that's a long walk through what presumably remains a middle school (I suppose this does not matter if Kindergarten is half-day, but it's a problem if the they are in all-day Kindergarten). 2. Alighting and boarding of school buses would presumably take place at the front of the building, which is also one floor up from those basement classrooms and requires interaction with middle-school pupils. 3. 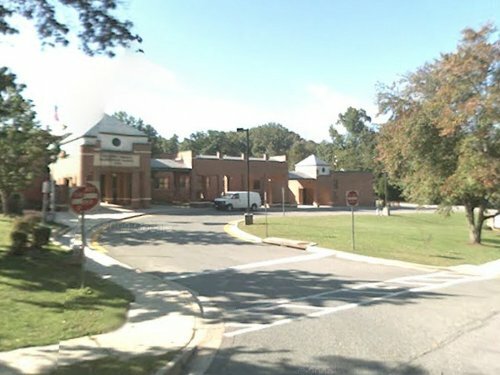 The basement classrooms face a faculty parking lot and M-NCP&PC's Sligo Creek Park on the east side. Were I a parent, it would seem to me that this could be a threat to the safety of my children, given the easy access to the park (I do not believe there is a fence between the school and park property). @Susan: Sorry to offend Wrote those comments on different days and guess I forgot I had made my point. Just a couple responses. Hybrid Schooling neq Home Schooling. But the controversy over the latter is, I think, preventing the former from being seriously considered. Take your own response for example. Actually I know quite a few Moms and Dads who struggle with handing their babies over to the state come Kindergarten and who might appreciate another year, even if only in a collaborative role with the teacher. Sending Kindergartners to Middle School may be the only solution in the end. I was just trying to suggest there might be alternatives if we can think out of the box a little. Susan, yeah lighten up. There's a whole other community of people out there who believe they - not the state - should play the lead in raising and educating their children. Meredith, my kids are all grown up. But I think I would have been interested in this hybrid approach if the school had offered it. @Meredith and Rich: It's not that I'm against parents choosing alternative schooling methods. But it's not a solution to this problem, although it might be a solution for individual families. We need to hold MCPS to their obligation, which is to provide an appropriate educational environment for all children in the county. You can bet that this is not happening in Potomac or "North Bethesda" schools. In this economy, particularly, many many families can't afford to have one parent stay home with children, even part time. To say, "just stay home with your kids more" is -- although I hate to use this word because it's been misappropriated by political causes I don't like -- elitist. Again, it's a perfectly fine solution for an individual family, but not for this school cluster as a whole. Let's not let MCPS off the hook! The school system's attitude is always: this is the way it is, take it or leave it. I hope the parents in this cluster don't give them the satisfaction. ummmm, i believe that my likeness was used without my permission on page 23 on that pdf...i want compensation!